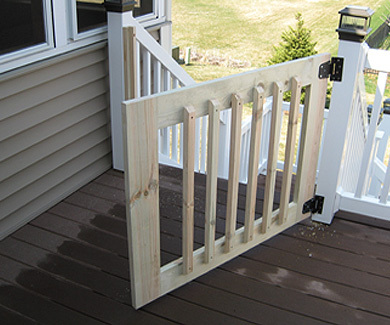 "Just wanted to show you the final product of that top of stairs gate. It works perfectly and melds beautifully with the stairwell. I can finally breathe easy knowing my daughter will be safe when we are upstairs. Thank you so much for working with me through this process. Your product is outstanding! " "My gate was installed yesterday and looks great! My installer was impressed with your workmanship and how easy the gate was to install; he said the video was perfect! " "Our gates look GREAT! We now have peace of mind that we're well-prepared (at least on gates) when our son gets mobile. And the rep from Mr Handyman did an excellent job making the necessary tweaking the gate to swing properly." A gift for all of us! "I just wanted to say how absolutely pleased and delighted we all are with the gate for my Mom's house! The craftsmanship is superb and the color match is perfect!! Thank you for helping us keep our Mom safe. It is a gift for all of us!" "It is so rare that I run into a service provider that meets or exceeds my expectations, but Gatekeepers went far beyond anything I could have imagined. My 91-year old mother suddenly decided to move back into her condo, and we needed to quickly put safety measures in place. I reached out to Gatekeepers on Memorial Day via email and within 10 minutes Tom called me and later that day we did a real-time video where we measured the stairwell opening and put the order in place (yes on a HOLIDAY!). Gatekeepers let me know the status all the way through the process and the gate was delivered EXACTLY on the delivery date. Gatekeepers hardcopy instructions and video support guided me throughout the entire process. But more than that - the gate was of such high quality and workmanship - it looked like it was created by the same carpenter who created the original stairway and woodwork. I couldn't be happier with the product! I recommend Gatekeepers without hesitation!" "I cannot say enough good things about the Gatekeepers gate. We have owned ours since 2008. They are wonderfully constructed. It matches my woodwork perfectly. My son recently had one installed because he knows how well ours has worked. It looks just as good." Impressive personalization ... it perfectly matched my stain! "I was quite impressed by the way it was packaged. I usually don't write testimonials but was so please with the overall process and quality of gate that I felt compelled to take time out to do so. First of all let me start by saying that at first the price for the gate seemed pricey and that almost deterred me from making the purchase. I am so glad that I did my homework and decided to purchase from Gatekeepers. The personalization and the time you took to explain the process and go over the exact measurements really created value to the overall experience and end product. 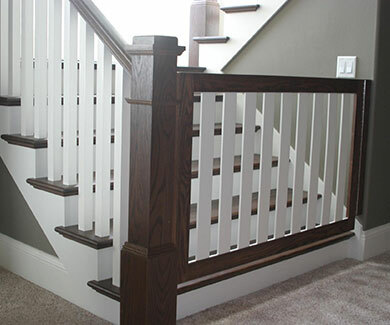 Gatekeepers was able to perfectly match my stain, using the same brand and color we had used for the stairs. Again adding to the value and quality. The installation was a breeze and the video you sent was quite helpful! For anyone reading this I can't tell you how good the quality and workmanship really is. There is no comparison to any other gate out on the market that I could find. Thank you Gatekeepers for doing business the way you do. It has become a lost art in this Internet age to find a business that does things the right way." "We have a son who is 4 1/2 who has special needs. For safety reasons we need to keep him on 2 levels & monitor his use of steps. We live in a tri-level house and have used numerous things for gates (plastic, wood & even homemade barriers). He throws items over, pushes things under, chews the gates, climbs on them and inevitably destroys everything we've tried. We could not stop him from his fascination with ripping these down. We went to a friends house and saw this beautiful wooden gate that they had made and gave us the name of this company called "Gatekeepers". It was by far the best investment for our home and our son we could have ever made. We discussed our concerns with Tom, told him what our son does and he took measurements and made the perfect gate for our home. After almost a year our son still has not been able to figure out how to destroy it. It is extremely strong, beautiful and works great. We have had so many compliments and I can't thank Tom enough for making our son safe, being so professional and such a caring person. His perfection for his workmanship shows in the quality of his products and the quality of his company. He listens and can give you exactly the product and peace of mind you need to make sure your home is safe for your family. We will never go anywhere else. Thank you Tom!" "We are so very very happy with our new gate. My wonderful husband installed it and it looks beautiful, as if it was original to the house. It has excellent craftsmanship and was engineered very well. It's strong, safe, has style, and is so easy to use. We can see you put lots of thought into its design. We love it. Your invention is our enjoyment! 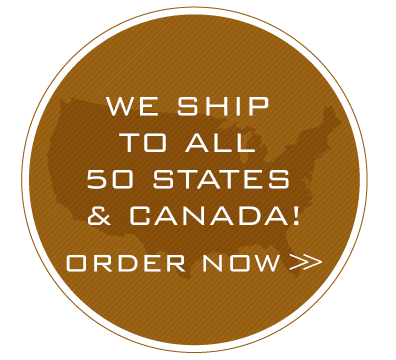 We couldn't find anything locally that included a strong design, good quality, that was safe, and reasonably priced. We looked at stores and even tried working with two master carpenters, with prices upwards of two grand. An internet search and several phone calls later with you, we had a beautifully made gate that fits perfectly and works fantastic." "Having a child with Sturge-Weber syndrome has brought many concerns to our lives. Even though the birthmark on the outside does not look harmful, the involvement in the brain has caused many seizures and stroke-like episodes in our child. Having three other children to take care of during a hectic day means that we cannot keep 100% of our attention on our son. 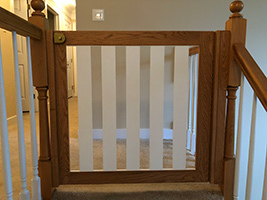 Since we have installed a Gatekeepers Swing Gate, it has brought a peace to our lives because we know that while our son is becoming more mobile, he cannot fall down the stairs if he gets too close while we are not watching. The risk of further brain injury is far greater with a fall and there are many risks for him, but falling down the stairs is the most preventable. We tried other gates in the past and were not satisfied. Some did not have a safe and easy latch system and others were not visually pleasing. The people from Gatekeepers came to our house, assessed the areas and potential risks, and then custom-fit, sturdy, safe gate that matched our current woodwork. It not only gives us peace, but the stylish look adds to the value of our home!" "Our lives are busy. 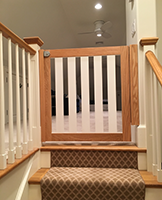 With the pets and one toddler and two infants, the Gatekeepers systems that were installed at the top of our stairs were exactly what we were looking for to provide safety and control. 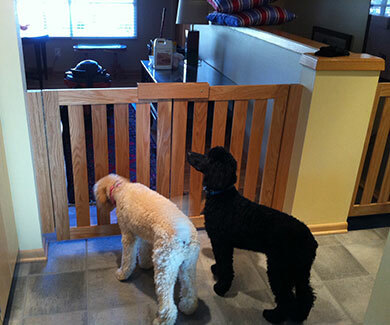 It keeps our dogs contained and has eliminated our fear of the children falling." "We feel much better about our grandchildren playing in our home with the safety of the Gatekeeper's system at the top of our stairs. We also like that we can remove the gate when they are not here. The Cherry wood and finish matches the rest of the decor in our house." Business protects customers with a Gatekeepers gate. Pam Totzke and Kim Kapugi, co-owners of What’s Brewin’ Café and Coffee Bar in Sun Prairie, did everything they could think of to alert patrons	about a tricky step in their café. They tried brightly colored tape and a variety of different signs, but weren’t able to completely prevent trips and tumbles from taking place. Luckily, Gatekeepers owner Tom Mitchell is a regular customer of What’s Brewin’, and knew Totzke and Kapugi were struggling with this safety issue. He suggested a Gatekeepers gate for the area, and the rest, as they say, is history. Sturdy Gatekeepers gate elimates the worry of falls in local daycare. As a daycare provider, safety is always a concern. Donna Sprecher knows how quickly accidents can happen and she is vigilant about doing everything possible to ensure the safety of those in her care. 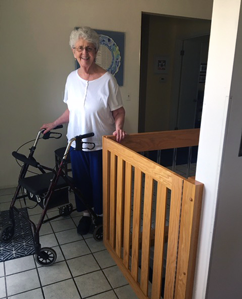 Over the years, Donna has tried a number of different safety gates for the top of her stairs, but never felt 100 percent confident. “Even with the gate in place, I was constantly hovering because I knew if the kids pushed hard enough they could probably push through. It was always a worry and really kind of scary,” Sprecher said. Timing is everything for Gina King. 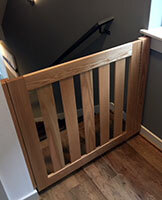 She and her husband had “tried every gate on the market,” but continued to be concerned that their young son would push right through the gate at the top of the stairs. He had recently started to crawl and was extremely curious about his surroundings. His safety was a constant worry because he was into everything and moving quickly. “With the way our woodwork and stairs are designed, it was really difficult to find anything that would stay secure at the top of our stairs,” King said. The Kings were so pleased with their first gate that it wasn’t long before they ordered a second one for the bottom of their staircase. They insist they couldn’t be happier with their Gatekeepers experience.